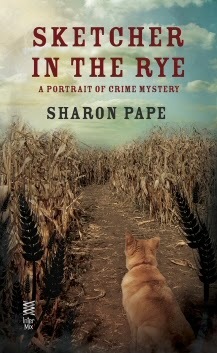 by Rory McCain from SKETCHER IN THE RYE, the fourth book in the Portrait of Crime Mysteries, by Sharon Pape. I was eating breakfast the other day when it occurred to me that Zeke, the deceased federal marshal with whom I share my home and detective agency, had been MIA for well over a week. Now don’t get me wrong, there have been plenty of times in our relationship when I would have welcomed the privacy, but I couldn’t recall him being absent for such a long stretch before, and it was starting to worry me. As far I knew he couldn’t leave my house, the house where he’d been shot and killed over a hundred and forty years ago, unless I was with him or he was traveling to meet me somewhere. Neither of us understood why I was able to provide him that kind of mobility, but we recently came across some startling clues that might eventually explain things. In any case, I decided it was pointless to keep wondering if he was all right when I could just ask him. Of course that approach didn’t always work for a variety of reasons, but it was certainly worth a shot. “Zeke? Zeke, are you there?” I called out to the empty room. Another few minutes passed before the marshal materialized in the chair across the table from me. His appearance generally matched his state of mind and that day he looked haggard. His hair was shaggier than usual, there were black circles under his eyes and his Wild West clothing looked like he’d slept in it for a month. “Are you okay?” I asked. “Yes, or I will be when I get some rest,” he said. “What happened?” Since he hadn’t used up his energy working a case with me, I couldn’t imagine what sort of problem had depleted him to such an extent. “Maybe you shouldn’t have fought it,” I murmured. The thought brought with it an unexpected pang of emptiness and loss. When I’d first moved into the house our relationship had been rocky to say the least, and I’d tried to talk him into following the light to his final destination. He’d told me back then he wasn’t ready to leave and refused to discuss it further. He leveled his eyes at me. “Still not ready, Darlin’,” he said. And this time I was so relieved to hear those words that I couldn’t contain the smile that spread across my face. Did you ever take an interesting wrong turn?